White clover. Yes, the kind that is covering your yard. It makes a phenomenal jelly that tastes like honey. 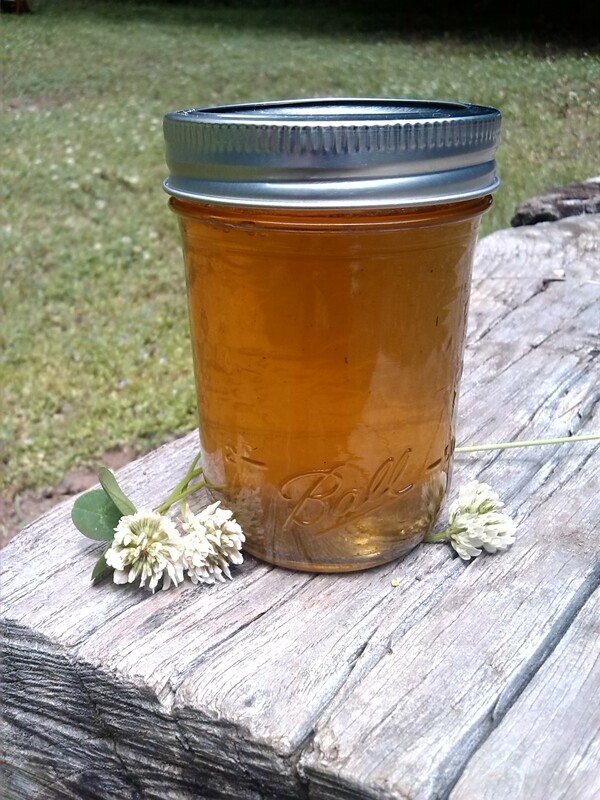 Here is a simple recipe to make white clover jelly. 2 heaping cups of fresh clover flowers, rinsed. 5 half pint jars and lids sterilized. Collect 2 heaping cups of white clover flowers. Rinse gently. Place the flowers in a large mason jar. Pour 2 cups of boiling water over the flowers. Place lid on jar loosely. Let sit for a minimum of 4 hours or over night. Strain the water from the flowers. You can use a mesh filter or cheese cloth. The product is called an infusion. I strain the infused water directly into the 2 quart pot that I make my jellies in. Bring the infusion to a boil. Add 4 cups of sugar. Stir occasionally. Add liquid Pectin. Stir frequently. Bring to a rolling boil. Stir while boiling for 5 minutes scooping off any foam in the process. Pour jelly into prepared jars. Attach lids and bands tightly. Water bath can the jars for 10 minutes. It takes about an hour for the jelly to set. Its amazing on fresh bread. YUM! well what do you know! add flowers to the ingredient list..just says clover. looking forward to more goodness! Good catch Kathy mae Stalker;). Thanks! Are you sure that the amount of boiling water is correct? I’m having a hard time thinking that you will get 4 cups of sugar into only 2 cups of liquid. Other jelly recipes I have seen use more like 5 cups of liquid for that amount of sugar. Yes. I’m sure. I use this recipe often. Feel free to experiment! I was looking at the abundeant clover in our yard yesterday and told my husband there must be something we can do with it….can’t wait to try this…thanks for the recipe ! Your welcome. You’ll love it! Inversion method is not a safe way to can anything. This kind of jelly must be frozen or refrigerated. 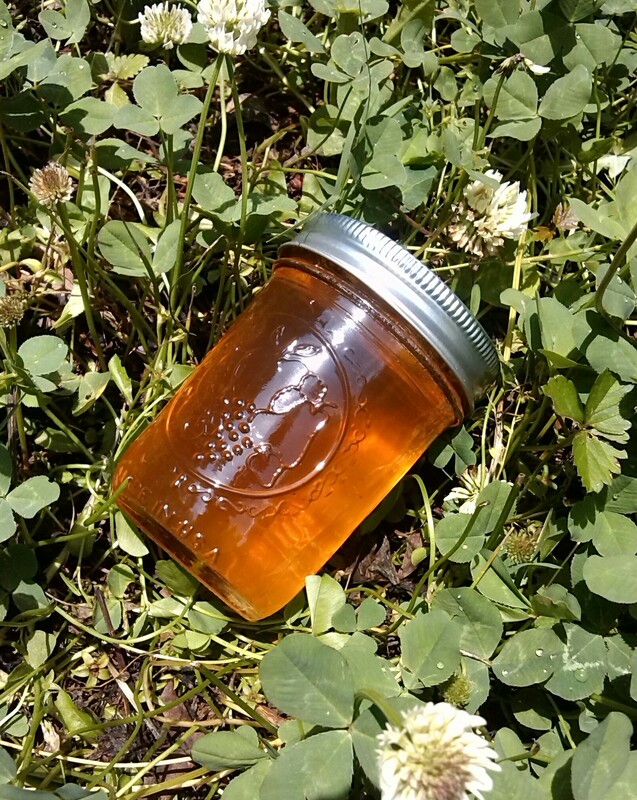 There are no safe canning methods for flower jellies/jams per NCHFP, Ball Blue Book or Bernardin. I agree. I suggested water bath canning. Thanks for the reminder to always be safe! What amount of head space is needed in each jar? If you don’t have or can’t get liquid pectin, how much sure jell would you use? One box of sure jell is equivalent to one pkg of liquid pectin. Just went and picked the clover from my yard. This sounds yummy. I also use the water bath method for all my jams and jellies, works great. Thanks for the recipe.